VATICAN CITY – Praying that God would protect Egypt from all evil, Pope Francis told the nation’s people that a world torn apart by indiscriminate violence needs courageous builders of peace, dialogue and justice. “I hope that this visit will be an embrace of consolation and of encouragement to all Christians in the Middle East; a message of friendship and esteem to all inhabitants of Egypt and the region; a message of fraternity and reconciliation to all children of Abraham, particularly in the Islamic world,” the pope said in a video message broadcast April 25, ahead of his April 28-29 trip to Cairo. “I hope that it may also offer a valid contribution to interreligious dialogue with the Islamic world and to ecumenical dialogue with the venerated and beloved Coptic Orthodox Church,” he said. “Our world, torn by blind violence, which has also afflicted the heart of your dear land, needs peace, love and mercy; it needs workers for peace, free and liberating people, courageous people able to learn from the past to build a future without closing themselves up in prejudices; it needs builders of bridges of peace, dialogue, brotherhood, justice, and humanity,” he said. Honored to visit the land visited by the Holy Family, the pope asked everyone for their prayers as he assured every one of his. He said it was “with a joyful and grateful heart” that he was heading to Egypt – the “cradle of civilization, gift of the Nile, land of sun and hospitality, where patriarchs and prophets lived” and where God – benevolent, merciful, and the one and almighty – made his voice heard. The day the video was released, April 25, was also the feast day of St. Mark, who evangelized the Egyptian port city of Alexandria, Egypt, before being martyred there. 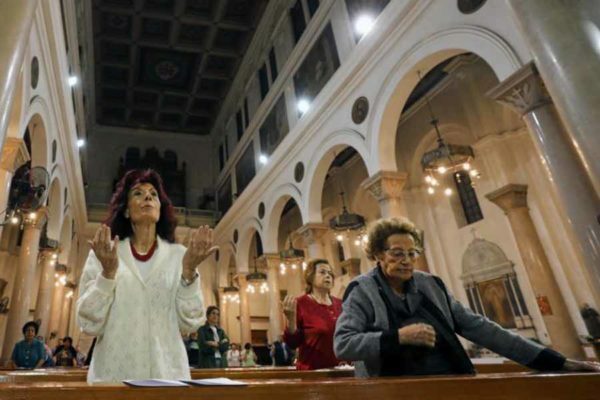 Christians in Egypt, Syria and Iraq struggle with mounting pressures from extremists challenging their religious identity and the right to practice their faith and continue to exist in their ancestral homelands. Pope Francis has urged an end to what he called a “genocide” against Christians in the Middle East, but he also has said it was wrong to equate Islam with violence. Christians are among the oldest religious communities in the Middle East, but their numbers are dwindling in the face of conflict and persecution. 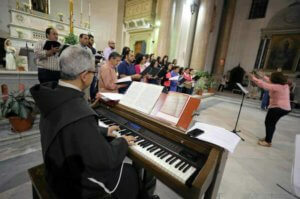 Egypt’s Christian community makes up about 10 percent of the country’s 92 million people. A high point in the pope’s schedule is an international peace conference at Cairo’s al-Azhar University, the world’s highest authority on Sunni Islam, hosted by Sheik Ahmad el-Tayeb, grand imam of the educational institution. Pope Tawadros and Ecumenical Patriarch Bartholomew, the spiritual head of the Eastern Orthodox churches, are also expected to participate. The pope will also meet separately with el-Sissi and other officials. Observers will be watching whether the pope will take on thorny issues with his hosts, such as the detention of thousands of Egyptians, without due process, simply held on suspicion of opposing el-Sissi. Others will watch to see if Pope Francis prods the Sunni Muslim religious establishment to take a more forceful stand on religious extremism perpetrated in the name of God. Many hope the al-Azhar meeting will sound a moral wake-up call to leaders worldwide to combat religious intolerance while seeking greater cooperation to fight growing threats by Islamic State and other extremist groups.